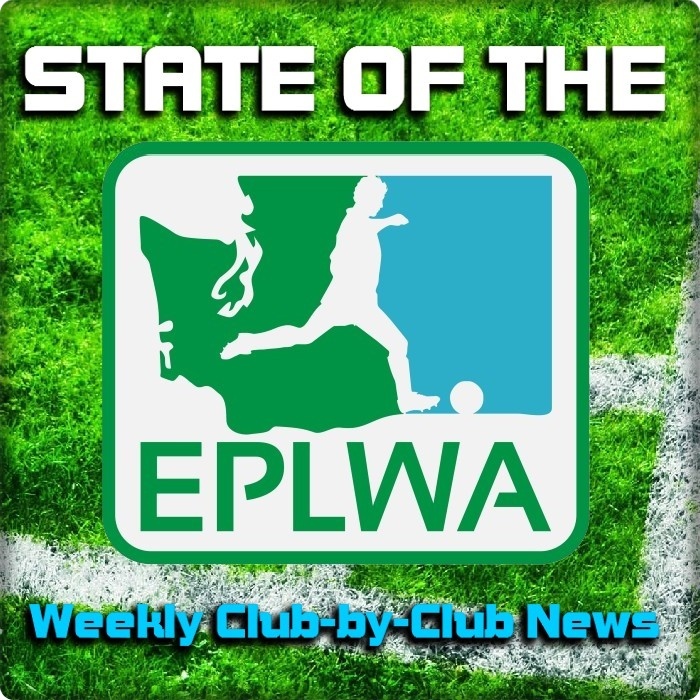 Welcome to the State of the EPLWA, a weekly update that will be posted on Mondays during the regular season. The Evergreen Premier League kicks off its inaugural season with a single match on Saturday April 26 as Seattle Stars FC visit Yakima United FC at Marquette Stadium at 6 PM. The next day (Sunday, April 27) four more clubs are in action as Bellingham United FC hosts Vancouver Victory FC at 3 PM at Civic Stadium and WestSound FC hosts South Sound FC at 4 PM at Silverdale Stadium. It’s the culmination of months and months of off-season preparation by clubs and the league. It seems like just yesterday that the league was floated as an idea (July 2013), began taking applications (July 2013), held its first conference call (August 2013) and began admitting clubs (August 2013.) The calendar gave us clues that the league launch was drawing closer when clubs met in Wenatchee (January 2014) for the first-ever Annual General Meeting. It was clear that statewide elite men’s soccer was upon us when we started hearing reports of pre-season matches. 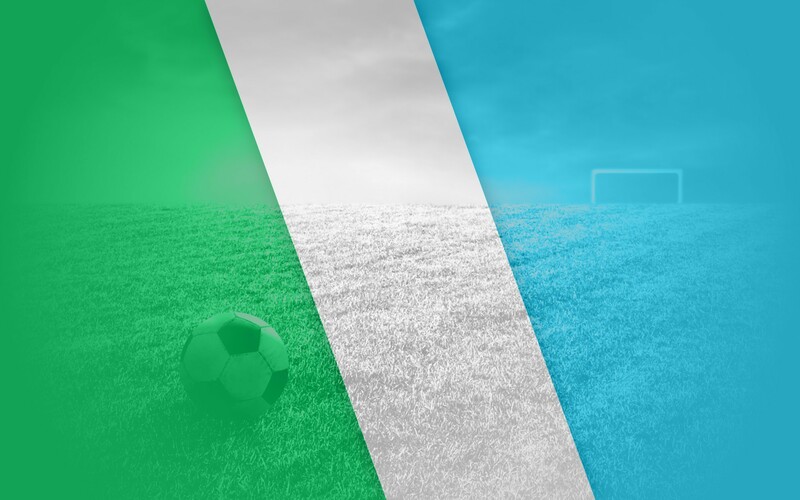 Now the first-ever match week is here, and this time next week this column will include scores and notes from actual league matches! Let’s take our first club-by-club look at news, notes and links below! 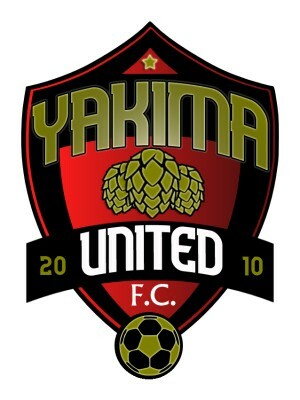 THIS WEEK: Saturday April 26 Yakima United FC v. Seattle Stars FC, 6 PM, Marquette Stadium, Yakima. 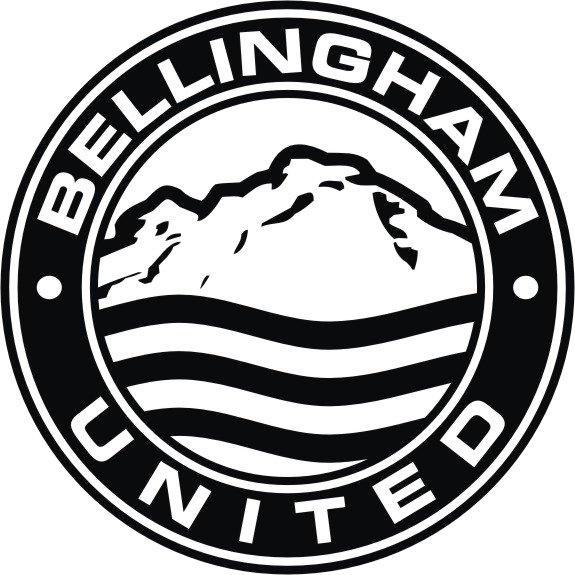 Sunday April 27 Bellingham United FC v. Vancouver Victory FC, 3 PM, Civic Stadium, Bellingham. WestSound FC v. South Sound FC, 4 PM, Silverdale Stadium, Silverdale. Complete league season schedule. 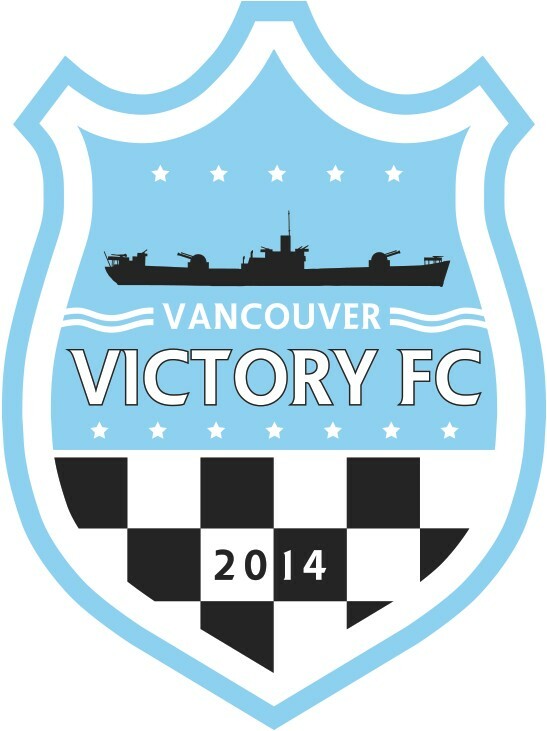 The Hammers open their 2014 EPLWA season on Sunday April 27 when they host the Vancouver Victory at Civic Stadium at 3 PM. During the off-season Vancouver owner Barrett Goddard made a trip to Bellingham to learn more about the Hammers’ successful operations. This time he will be bringing a roster of players north with him. The Hammers have played three announced pre-season matches. They fell 2-1 at Seattle Sporting FC of the NPSL, 6-1 at Kitsap Pumas of the PDL, and 2-1 at Western Washington University’s Vikings last Friday night. While they of course would have preferred to win these matches, the losses are tempered with the knowledge that Bellingham will have college players joining them as of May 1st. Getting valuable time to know his new team is forward Carlos Betancourt. When goalWA.net did a feature on Carlos earlier this year he was playing with Seattle Stars FC. Since then Carlos has transferred over to Bellingham United. He scored a pre-season goal against the Kitsap Pumas. Betancourt and veterans such as Sean Connor and Joel Grossman will be important factors in the Hammers home opener. Our partners over at goalWA.net have noted that the Hammers have a very tough early schedule, with most of their matches away. Last week BUFC hosted a player meet and greet and distributed season tickets. Fans gathered for the event at The Copper Hog. Seattle Stars FC have the honor —and task—of helping open the league when they travel to Yakima on Saturday April 26th. The Stars and Hoppers are very familiar with each other. They used to meet in the American National Soccer League (ANSL) Washington Division. In 2011 they faced off for that division’s title. Seattle has publicized just one pre-season match. That turned out to be a 3-0 loss in Bremerton to the Kitsap Pumas. The Stars won the Fall 2013 Starfire Premier League, but since then have been fending off defections of players who have moved on to Seattle’s two NPSL clubs. One might think that year-round play would give Seattle some kind of advantage entering into EPLWA competition. That’s possible, but the new faces on the Stars roster might counteract any advantage. The Stars have played a few friendlies, including one in late March against a Gambian-infused side. The club is also proud that their year-round status isn’t interrupted—even by a little snow. Head Coach Alex Kajumulo is one of the most energetic, creative people in Northwest soccer. He has his hand in multiple events, charities and causes. He’s also a performer. South Sound Football Club played the Sounders Academy last weekend at Starfire and battled well in an eventual 3-2 defeat. Previously in pre-season the Shock had played to a 2-2 draw at Gorge FC (NPSL) and beaten Yamhill County Crew 5-2. The match against the Sounders featured midfielder Daniel Gray, who would be a big help to the SSFC chances if he’s onboard for the EPLWA campaign. 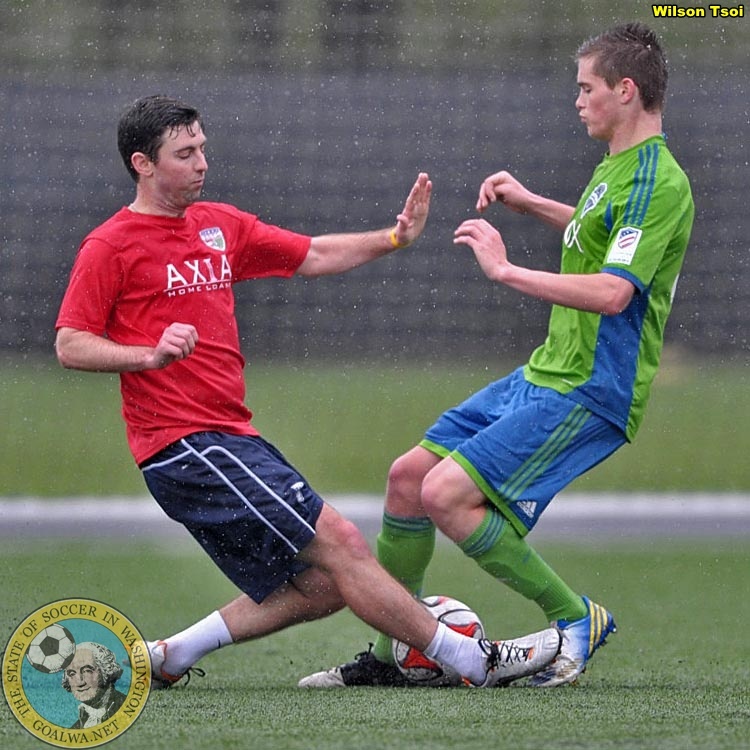 Gray has previous experience with Tacoma Tide FC, a former PDL side that is now the Sounders U-23. South Sound opens their season Sunday April 27 when they make the short drive to Bremerton to tangle with WestSound FC at 4 PM in Silverdale Stadium. The SSFC fixture list includes an early five-match homestand where the side will need to get on a roll. The Shock play indoors during the winter, but also compete in the USASA U-23 Nationals. They have made the semifinals two years running. With a younger squad it isn’t a stretch to assume the club might be fitter than some. We’ll see if that plays to their advantage. South Sound announced this week that Doyle’s Public House will be their official pub partner. Earlier they secured the Tacoma Soccer Center as their shirt sponsor. The Shadow have released a string of head-turning news items in recent weeks. Spokane native Chad Brown was introduced as their first head coach. They announced that former MLS Sounder Kevin Forrest will join the club for the EPLWA season. Then the Shadow introduced five Gonzaga Bulldog Division One players that will bolster their roster. 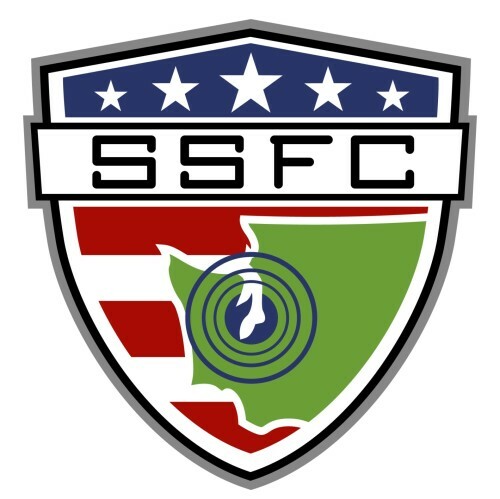 Just this week the club revealed a secondary crest that honors Shadow history and Spokane iconography. Spokane makes its league debut in the season’s second week when they host Bellingham United at Spokane Falls CC Stadium at 7 PM on Saturday May 3rd. The Shadow are hoping to get in a pre-season match before then. Access to high-caliber college players is bound to help Spokane. Meanwhile Forrest will not train with the team during the week (as he does not live in Spokane) but will meet up with them for matches. Shadow GM Gerald Barnhart has been providing a mobile Shadow Shop to give Lilac City soccer fans more chances to purchase tickets and gear. 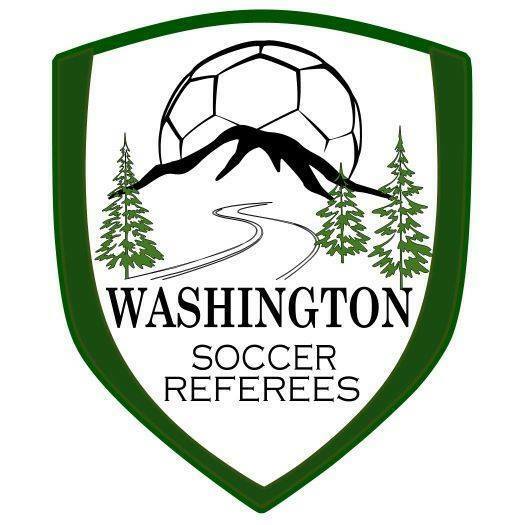 He’s also been busy getting his players registered with the Washington State Adult Soccer Association. It’s encouraging for the Shadow that local press are starting to feature club press releases. The Victory are getting ready to travel up I-5 to play Bellingham United FC on Sunday April 27 in the Hammers home opener at 3 PM in Civic Stadium. In recent days V2FC have played pre-season friendlies and announced a major sponsor. Vancouver is getting great pre-season play from striker Borce (pronounced Bor-chay) Atanasov, who has hat tricks in both his appearances. He scored three against Everett United in as 4-2 Vancouver win and another three (in the first half) against Portland Community College in a 6-1 V2FC triumph last Saturday. The Victory scored big when they confirmed Muchias Gracias Mexican Food as a two-year shirt sponsor. The Southwest Washington – Northwest Oregon chain immediately found a place on the custom V2FC kits. Bellingham fans could have some competition in the stands for noise and color. The Vanguard is planning to bring some supporters up for Sunday’s opener. Before their opener the Victory have scheduled another pre-season match for this week. The Victory take the field Thursday April 24th against Portland club side Red Army at Luke Jensen field on Thursday with an 8:15 PM kick off. The match is free for season ticket holders. $2 for all other spectators. 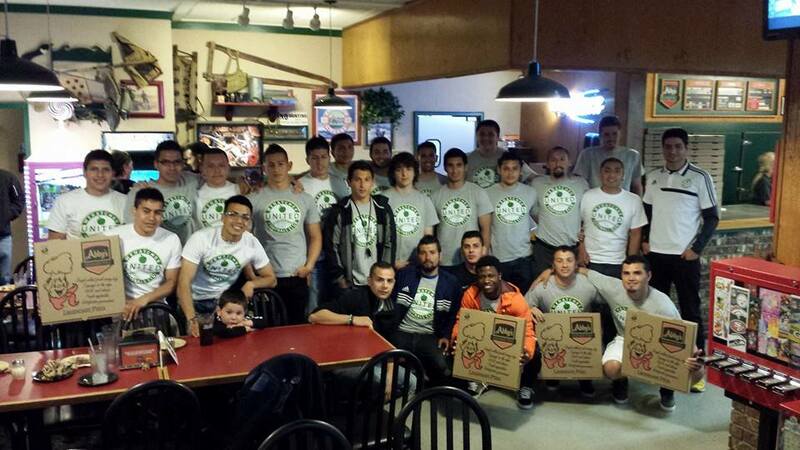 Wenatchee United team dinner at Abby’s Pizza last week. Wenatchee is the other club, along with Spokane, that doesn’t play the first weekend. 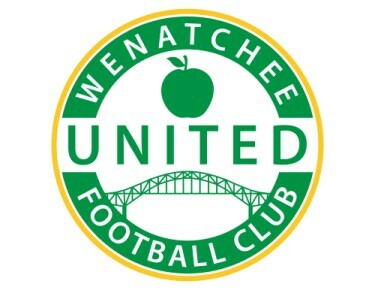 Instead, WUFC will wait until Sunday May 4 at 4 PM at the Apple Bowl to kick off against Bellingham United. United will play an intrasquad match this Tuesday that is open for fans to attend. Wenatchee sponsor Abby’s Pizza hosted a team dinner for the guys last week. The club later posted a gallery of player profile photos of the WenUTD roster. Things could be noisy in the stands if the supporters group The Bridge Mafia takes off. This weekend Wenatchee will travel to Port Angeles to take park in the second annual Rumble in the Rainforest. WUFC will play two 60-minute matches, against two-time defending NWAACC Champion Peninsula College Pirates, and 2011 PDL Champions Kitsap Pumas. It’s been a hectic spring for the youth club that the WestSound FC Men are attached to. WSFC has confirmed a merger with a handful of other Kitsap youth clubs. Meanwhile the men’s side has gathered the best amateur talent in the area as they prepare to host South Sound FC on Sunday April 27 at 4 PM in Silverdale Stadium. The WestSound Men have played just one announced pre-season match, a 1-0 loss to Evergreen State University on April 5th. This week on their Facebook page the club has been linking to player features. 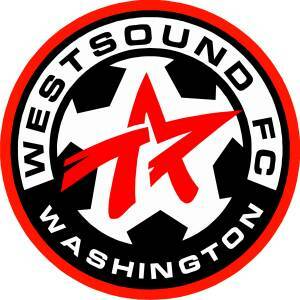 Last summer WestSound played a schedule of friendlies as they were applying to join the EPLWA. They saw action against Bellingham United and South Sound during that stretch. This year they will be up against the top talent that both of those sides can muster. Silverdale Stadium is just 30 seconds by car from Gordon Field, home of the Kitsap Pumas of the PDL. Yakima United FC has the privilege of hosting the first-ever EPLWA match this Saturday at 6 PM against Seattle Stars FC at Marquette Stadium. It’s a new era for soccer in the Yakima Valley, as well as a new start for United. The Yakima Reds had the longest run of any Washington pro or semi-pro club ever when they went 16 seasons in the USL from 1995-2010. This pre-season the Hoppers have played Alianza Tri-Cities to a 2-2 draw and topped the Nampa Idaho All-Stars 3-2 last Saturday. The club has been a hit off of the pitch with their hops-inspired crest. It has gotten the attention of supporters far beyond the valley and has already been a contest-winner. The Hoppers roster looks to me a unique blend of local veteran talent, including a few former Reds, college players, and new youth discoveries. Come back every Monday to read more “State of the EPLWA” news! Here’s the first entry in the Monday series “State of the EPLWA.” Season starts this week!